I've been sent these gloves from Firebox, the Isotoner SmarTouch gloves. Firebox wants them back as they're review samples and, snow allowing, I'm expecting a courier to pick them up tomorrow. Oh, and I've ordered a pair for myself immediately. They're only just under £15 and they're brilliant. They look, as you'll see from the picture, like an ordinary pair of wool gloves. 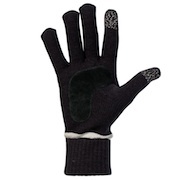 They fit perfectly, one of these one-size-fits-all jobbies, look, it couldn't be more straightforward if it tried, they're wool gloves and they fit like a glove. You'll notice, though, that the thumb and forefinger has a little design on it. This is slightly more than a design. It has a little texture on it - nothing you'd really notice unless you were looking for it but - clever bit coming - enough to allow you to use a touch screen without taking your glove off. So that's your Android phone, your iPad, your iPhone, all usable when it's flaming freezing like it is now by using something that doesn't have "I'm a geeky gadget" written all over it. Just a short entry today. I'm busy being bemused by the video on this link, which is a my-wardrobe video guide on how to wear a scarf. Obviously the one where you just throw it over your neck is the one which really didn't need a video explanation but the bit that really gets to me is the third one. In this, the demonstrator tucks the scarf around the model's lapel (serious stuff this scarf-wearing, definitely takes two) so that only a little bit of it is showing. Call me naive, call me old fashioned - but since this leaves your throat totally exposed, doesn't it take away the whole point of a scarf in the first place? Or am I just naive in thinking that retaining a vestige of their original function, i.e. offering a bit of warmth, would at least not be a bad idea..? Sometimes the best ideas are the simplest, and this is the case with Asos' new marketplace. The idea is very straightforward. You take a garment you don't like and put it online. You can set up a trade account if you're a boutique and put loads of clothes on there. Someone buys it, you send it. People who use the Amazon marketplace scheme might find this sounds a bit familiar, and that's why it's so clever. It gets people to the site and Asos, a noted online fashion retailer, creams off some of the cash from that area without touching the goods. It'll be interesting to see some of the items that come up, mind you. Parting with still-trendy stuff that just doesn't fit any more is one thing; finding a buyer for major sartorial errors is another. Will the blokes section be packed out with too-wide Marks and Sparks ties from the seventies from men who've never worn them..? As a basic idea, though, as long as people are sensible about the quality they put up for sale, it's a cracking idea. 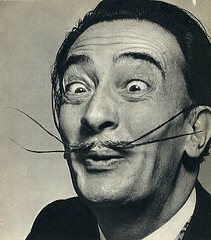 Tailored accessories - suit you sir..? The guys at A Suit That Fits tell me they're launching a set of bespoke accessories. It's not a bad idea but there's an obvious absentee. As of today, if you fish around on the site a bit you can get hand-made silk pocket squares, for example. I have had a few of these as they've been available as add-ons to suit purchases, matching the lining, and if you tone it in right they can look very stylish in a jacket pocket. Cravats are also available to match as are silk bow ties, then there's the metalware - you can get collar studs, collar stiffeners and cufflinks (pictured). They'll engrave initials on the cufflinks if you wish - you might feel this isn't exactly bespoke but I'm happy to let one-size-fits-all cufflinks go through on the nod. Silk cummerbunds are also available for seriously formal occasions and for blokes who can afford to draw attention to their midriffs. That's me out, for a start. What's missing - and I understand there are plans afoot - is the ordinary and rather humble tie. They're not easy to get right, of course. I have several and some, from quite reputable retailers, have gone flimsy and look like a rag after a couple of wears; others have bobbled badly because I've rashly worn a coat over my suit. It would make sense, though, to offer a full service for blokes who might want a bit of colour co-ordinating. A tie to match or tone in with the suit lining you've chosen would be an easy sale I'd have thought, and might even stop my other half staring quite so disparagingly at some of my choices in that department. I suspect - and I'm only guessing - that part of the issue is how to make a bespoke tie from the customer's choice of fabric, to the length and width they want, without charging silly money and therefore not selling any. The other thing, of course, is that they remain a reasonably small team and can only do so much at a time. There's a silver jeweller near me, Margaret Mims, who makes very nice cufflinks by hand so I can't see myself deserting here to be honest. But moving closer to the one-stop shop looks like a good idea. P. S. Congrats to the same team for winning best Etailer at the Drapers Awards last night. Anyone else involved in the tailoring business or men's fashion who's gaining similar recognition is welcome to get in touch. OK, I've had a 3D TV for a couple of months so it's time for a bit of a review. I also hosted a discussion on 3D TV for Bafta (guide to the pic at the bottom of this post) and have some strong opinions. First I should state that the model I'm using is passive rather than active. This means that there's no battery for the glasses, which work by filtering out half of the image for each eye so you get a stereo image just as you do when you're looking at things in real life. The more expensive active sort actually flick on and off faster than the eye can see, in time with the television, so you get the same effect but with twice as many pixels so it's true HD. My way the glasses cost about a quid if you sit on them the active sort are much more expensive. The first thing to say about the televisions themselves is that they're great but, umm, quite big. People are buying larger tellies than they used to, of course, but starting at 42in and going up is going to stretch a lot of living rooms. We had to buy a new TV stand before it was really comfortable to view. So I bought my daughter a copy of "Cloudy With A Chance Of Meatballs" - only to find it was coming up free of charge on Sky, clever Daddy, just go burn a fiver while you're at it - and the 3D is actually pretty effective. At least that's what I thought; the sporting events you can get are also pretty good, and the other movies look excellent. Next year other channels will start to broadcast in 3D (at the moment it's only Sky in the UK). Oddly my wife didn't think it was that great, mostly because it gave her a honking great headache. I'm going to look into that and see whether it's a known thing that affects some of the population. Oh, and the film was pretty naff. I'm really looking forward to the Christmas broadcasts of the Toy Story trilogy in 3D; as we concluded on the panel, you need something that's entertaining to watch whether it's in 3D or not when you sit down to a movie or TV programme (which is why I haven't bothered watching "Are You Smarter Than A Ten Year Old" in the new format - I mean, WHY..?) - and the films and TV which will inevitably come out in 3D just because they can won't be worth watching. So, is a 3D TV worth it? My instinct is that it will be when there's more of a range of sizes around and prices have come down a bit - but mostly when there's more decent 3D programming around. I'm mostly using it as an ordinary high-def TV at the moment. Who's who in the pic: Jonathan Fawkner of Framestore, who was FX supervisor on Avatar; Sam McCurdy, cinematographer, StreetDance 3D, Phil Streather, CEO of Principally Large Format, Anita Perrett, makeup designer on Sky, fat bloke doing the interview. Photo with thanks by Mark Bassett. Coats can be a bit tricky for a bloke. I have a favourite three-or-so-years-old thing from Next, which I bought purely because I was out one day and hadn't allowed for the drop in temperature, so I spent my sixty quid. It's warm, fleecy inside and it's a good dog-walking coat. In other words it would look a bit rubbish with a jacket or suit. Not that it ever claimed to be a formal coat. But is it worth spending out on something that's going to be only occasional, for formal wear (and my need to look formal is irregular - a couple of weeks ago I was suited every day, this week not at all, that's freelancing for you). So much as I'd like something tailored - the guys at asuitthatfits (sponsored link, I get points if you click through, make an appointment or whatever) offer fully bespoke offerings for £300 and for a bit extra you can have a detachable quilted lining so we're talking seriously warm - I can't justify the cost for very occasional wear. So something which could just about pass in a formal setting as long as nobody looks too closely but which also works casually would probably be a good idea. 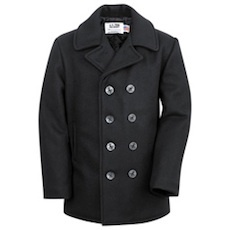 This is why I'm considering a pea coat. I have no idea where the term 'pea coat' comes from but this new one from Schott (pictured) has the right air for smart casual but isn't going to look desperately out of place over smarter clothes. (Of course it won't stand up to close scrutiny but that's not such an issue for very occasional wear). It's also just about short enough not to scrunch up when you're driving. I've no idea who stocks these things but the RRP is £170. It's November and since 2003 that can only mean one thing. OK, two things: it's now the 10th so I can stop hiding from kids with 'hilarious' Guy Fawkes jokes (I've heard them before, you don't get to be a 45 year old Guy withoutnthem) - and it's Movember. This is a relatively new tradition in which a whole bunch of blokes grow a moustache to raise money for research into testicular cancer. The thing about this cancer is that it's as much a killer as any of the others but because blokes are a bit embarrassed by the thought of checking their whatsits over, they end up with it anyway. There are a few myths worth exploding. First, if you get it and need a surgical removal, you'll survive and you won't be infertile. The father of one of my daughter's friends from school has been affected and his daughter is living proof that the remaining bits are still in perfect working order, thanks. But it's an eminently preventable thing if you detect it early enough and a lot of people are dying too early as a result. I've left it a bit late to grow a 'tache myself; there are 20 days left and although I'm older now, my efforts at doing so at college have left me with no faith at all in my ability to grow anything other than a multicoloured bit of stubble in that time (much as I did 25 years ago, except there will now be more grey). But if anyone wants to sponsor someone who's doing so, you can find them through the link above. And of course if you're taking part yourself I'd be delighted if you left a comment with a link on the end of this blog entry. In the last 40 or so years, a brilliant job has been done raising awareness and reducing some of the numbers for breast cancer, ovarian cancer and a lot of other female-specific cancers (although men can also get breast cancer). It's an excellent example and one that we blokes should make every effort to follow. ...and a warm welcome to a magazine that looks set to fill just the gap I'm aiming for with this blog. Gaz7etta has been doing the rounds as a pilot issue - I had my copy with a subscription issue of the Times last week, others have been given away elsewhere. 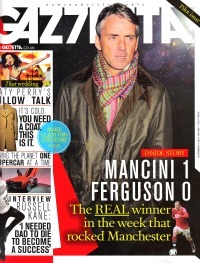 The idea is to have a stablemate for Grazia but to target the men's market and for once, I'm delighted to say, it's not packed out with scantily clad women whose dad I'm old enough to be, nor does it assume that if I'm a bloke I must be interested in football. (Fans are certainly catered for, I know I'm in a minority here, but it's good that there's plenty of other stuff). I'd suggest this is a publication aimed precisely at the readers of this blog with only a few glitches - a must-have coat featured on the cover which costs £1500 is more of a can't-have coat for most of us, and for me Lemmy the Life Coach reads like an imitation of the Sunday Times advice column with Ozzy Osborne. But a great start. The publishers, Bauer, are hoping to make this weekly next year. You can get a copy of the pilot issue from the website here. So I'm a gadget geek, so what? Actually more accurately I'm a gadget writer so I get an excuse good professional reason to get the latest stuff. And in spite of the now-famous reception problems if you hold the thing in the wrong way, I'm very fond of my iPhone 4. Only the other day I was using it as a satnav to get me home from Oxford while it was playing an audiobook through the car's speakers with a Bluetooth connection. This stuff has never been so affordable or, more importantly, easy before. The only real difficulty is the reception - I mean, it's called a phone, you're going to want to use it to make the odd call. You get over this by buying a case, which was probably going to be a good idea anyway. 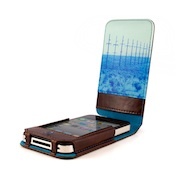 And I decided to go just a little more stylish this time with the brown leather Ted Baker iPhone 4 case from ProPorta. It's well padded and the design on the underside of the protective flap (see picture) is a nice little touch, although if it hadn't been there I doubt that I'd have noticed. Importantly it leaves the screen completely bare when open, so you might want to buy a stick-on gel cover to increase the phone's useful life, particularly if you're one of these people with sharp and non-chewed nails. Apple isn't in the habit of releasing flimsy rubbish onto the market but a weak point's a weak point, and this is definitely a weak point. The price, £39.95, is on the slightly expensive side of acceptable (it's only a case after all) and I admit I could have done without the Ted Baker logo on the front. Others will probably whoop with joy at it. It's available from 28 November. What does everyone else use? And although I like the look of my case and I enjoy using it, is it just me or is a phone that needs a case in order not to drop calls a bit of a cop-out..?